I remember, many, many years ago, a commercial where a young woman sat at the feet of an older woman who was in a rocking chair. The young woman looked at the camera and said something to the effect that the older woman said you cannot love a thing. Grammatically, "love" was only to be used between humans. Then the younger woman espoused the "love" she had for a brand of ice cream. The older woman scowled. The younger woman handed the older woman a spoonful of ice cream. After eating it, the older woman allowed that perhaps she had been wrong, snatched the ice cream from the younger woman and happily dug into it. This flickering image of an old commercial rose to my mind when I had this spread on toasted English muffins for breakfast on Sunday. I found this stuff at Target last weekend. I vaguely remember there used to be something like this years ago but it disappeared. This is soooo good. It spreads like peanut butter. The tastes of peanut butter AND chocolate are evident. And when spread on hot English muffins, it's heaven. I found a recipe for "Banana Chocolate French Toast" which has you put a chocolate spread, like Nutella, with bananas between whole wheat bread. I almost bought some Nutella but then I saw this. I'm going to make this french toast recipe and use this. Yes, there will be a post on how that turns out. 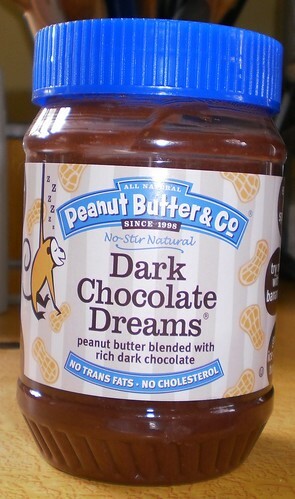 If you like peanut butter and chocolate, I strongly recommend you try to find this. Check Target first, in the peanut butter section. This won't be replacing peanut butter in my cupboard, but it has almost replaced it in my sandwiches. You can bet I'm always going to have a jar of this on the shelf.